Echoes of twenty years ago were sounded yesterday when a mother and daughter who had been separated for that length of time found each other through the medium of The Anderson Herald. Twenty years ago October 2, 1910 a baby girl was born on an interurban car at Fortville. The child and mother were brought to St. John’s hospital here. Limited circumstances prompted the mother to give her daughter to a woman at Fortville, who promised to rear the child. Four years ago the foster parent, Mrs. Charles Johnson, died. Shortly before her death Mrs. Johnson told her daughter, Eva Mary, about the adoption. Several years ago Miss Johnson married John Skinner of Fortville. During the past four years, Mrs. Skinner has made every possible effort to find her real mother. 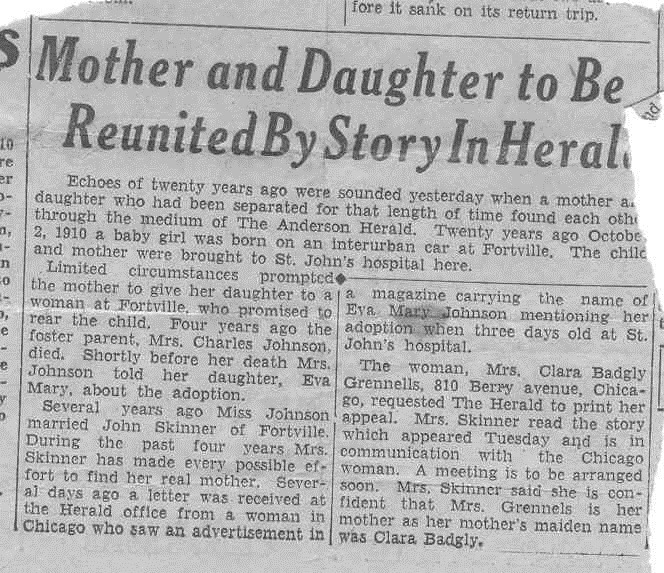 Several days ago a letter was received at the Herald office from a woman in Chicago who saw an advertisement in a magazine carrying the name of Eva Mary Johnson mentioning her adoption when three days old at St. John’s hospital. The woman, Mrs. Clara Badgly Grennells, 810 Berry Avenue, Chicago, requested The Herald to print her appeal. Mrs. Skinner read the story which appeared Tuesday and is in communication with the Chicago woman. A meeting is to be arranged soon. Mrs. Skinner said she is confident that Mrs. Grennels is her mother as her mother’s maiden name was Clara Badgly. And with that newspaper article, the search for the missing Clara began. I urge you to go back to a previously written post – Independent From Birth to read about the woman searching for Clara – my grandfather’s foster sister – Eva – before continuing on. Go ahead – I’ll wait . . .
Now for the inconsistencies that I know of: Eva’s full name was Eva Louise Johnson. The only reason I can think of that she would go by Eva Mary is because Mary was the name of the birth daughter of her foster parents. My grandfather’s baby sister, born in November 1909, died before she was a year old so perhaps my great-grandmother smashed the names together when she spoke to Eva. Maybe she really did grow up as Eva Mary but somewhere along the way became Eva Louise. The next error is the name of the woman who agreed to take Eva – it is not Mrs. Charles Johnson. It was Mrs. John Johnson. My great-grandmother was married to John Lafayette Johnson. In the 1910 census there are two other married adult “Charles Johnson’s” living in Anderson, Indiana. One is age 63 and married to his second wife, Fannie, age 37 with their fourteen year old son, Stanley. The other Charles Johnson is 23 and his wife, Alta, is two years younger. In the 1920 census there is not any household with a daughter, Eva, aged 9-10, with Charles Johnson as Head of the Household. The third error is the birth date. Eva’s date of birth has always been given as October 5, 1910 but if there is truth that she was three days old when Great-grandmother Katie took Eva then it would make her birth date October 2 but was given the October 5 birthday instead. Katie died in May 1930 so that would make the article dated in 1934 as it says “four years” since Katie’s death. On the 1930 Census taken a month before Katie died, in April 1930, Eva listed her age as nineteen and reported she had been married at age 18. They also had a son, Charles, who was four months old. 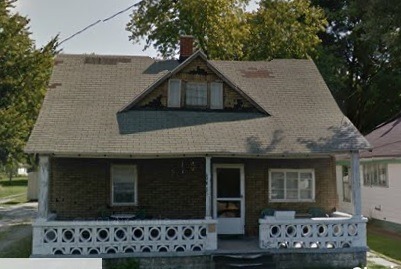 The family was living at 1618 Cincinnati Avenue in Anderson, Indiana – a three bedroom, one bath two-story home built in 1900. They were living there with two other families and renting a room. John was a machinist working for an auto parts factory. Within four years after that census was taken, Eva would begin her journey to find her biological mother. The newspaper clipping mentions a reunion. There were blatant errors in the first two paragraphs of the article. Could there possibly be more? Would Eva get the reunion she so desperately wanted? Florus A House, my grand uncle (brother to my paternal grandmother), was born on April 21, 1873 in Guernsey county, Ohio to James Emory House and Frances Virginia Ogan – who were not yet married. The marriage would take place one month later. Florus was named after his paternal grandfather (my 2nd great-grandfather). At the age of fifteen, my grand uncle was very ill. The “Semi-Weekly Age,” – a Coshocton county newspaper, reported in the April 20, 1888 edition that he was “on the sick list, with symptoms of lung fever.” At the age of nineteen, he was picking apples at a neighbor’s farm and fell from the tree. The “Coshocton Democratic Standard” reported in the October 21, 1892 edition that he “broke his fore arm and badly cut his face.” When his oldest son was nineteen, they both were in a mining accident. My father remembers that Florus had many facial scars from that accident. On July 26, 1899, he married Emma Caroline Stacer, who was born on June 4, 1879. 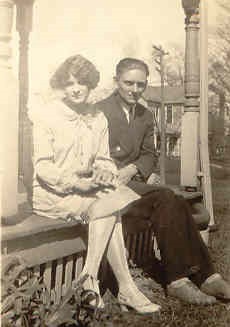 The couple bore 8 children: Harvey J House (born May 18, 1900), Gertrude M House (b. May 7, 1903), Mary H House (b. March 18, 1905), Ralph Frederick House (b. March 15, 1907), twins Wealtha Fay House and Welby James House (b. May 28, 1909), Dorthy E House (b. February 20, 1914), and Betty J House (b. private). In the 1900 census, the couple and their son, Harvey, were living in Jackson township in the county of Coshocton. Florus indicated that his occupation was that of a coal miner, and that he and Emma had been married less than a year. The family was living within the city limits of Coshocton at the time of the 1910 census. Besides their son, Harvey, the family also included Gertrude, (Mary) Helen, Ralph, and Wealtha. Her twin, Welby, had died less than two months after birth. He had been spina bifida. The July 12, 1909 edition of the “Coshocton Daily Times” mentioned that the baby “had been ill since his birth.” He was buried at Prairie Chapel Cemetery. The family stayed in Coshocton until between 1930 and 1935. The 1940 census showed that they were living in Tuscarawas township of the same county and had been there in 1935. Florus listed that he and his wife only had an 8th grade education (different than my grandmother and her sister who both graduated high school). They were members of the Coshocton Nazarene church. In the spring of 1941, Florus had surgery for a double hernia. That was probably just the beginning of his troubles. Within six weeks, the “Coshocton Tribune” was reporting (July 2, 1941) that his condition was critical. Eight days later the same newspaper reported his death in the Cleveland Marine hospital. He was 68 years old. His death certificate (image obtained from FamilySearch.org in the “Ohio Deaths, 1908-1953” database) lists his cause of death as “hypertrophy of prostate (about 1 year ago); pyelonephrtis, bilateral, chronic.” The online article “Bilateral Emphysematous Pyelonephritis in a Patient with No Known Risk Factors” from “The Journal of the National Medical Association” explains that it is a “rare life-threatening infection” (Hart, Peter D., Vaseemuddin, Mohammad, Egiebor, Osbert; J Natl Med Assoc. 2007 February; 99(2): 179–181. 29 July 2013). Funeral services for Florus were held at the Nazarene church, and he was buried at Prairie Chapel cemetery. His wife, Emma, survived him, dying fourteen years later, on December 12, 1965 in Akron, Ohio. She was buried next to him. It is believed that only one of his daughters is still living. Of research on the Amore branch of my family – that is! What do I know and what do I not know? In order to get to a point where I might have a chance at breaking through a brick wall, I need to re-visit my notes and sources and analyze what is in them as well as “see” what it is I may have missed in the last fourteen years. What I know: I have not been able to figure out who the parents are of my 2nd great-grandfather, William Amore. I do not know how old William was when he came from New York to Ohio. (Sounds more like things I don’t know!) But, as the saying goes: “you don’t know what you don’t know.” So at least I know a few things that I don’t know. Confused yet? A couple of years after I started delving into family history, one of my cousins said that William was born in Troy / Albany area of New York. What documentation have I located to prove that? The first census I found him in was the 1850 U.S. Census. He was enumerated living in the Thomas Buck household in Oxford township, Coshocton county, Ohio. His age was 22 and his place of birth was listed as Ohio. His profession was shoemaker and the value of his real estate was $200. Everyone in the household except for Thomas Buck was listed as born in Ohio – perhaps the enumerator just made a mistake – or someone else answered the question and not William (the enumerator used ditto marks). If William didn’t answer that question, who else would have known the value of his real estate? For that matter, what real estate would he have owned if he was living in a household not his own? William was married to Charlotte (my 2nd great-grandmother) by the 1860 U. S. Census and had four sons. They were living in Linton township – still in Coshocton county. William, age 33, is listed as born in Ohio again as well as everyone else. The enumerator did not write “Ohio” – just ditto marks (“) from a previous entry of “Ohio.” So there are two population schedules that list his birthplace as Ohio. His real estate value is $400 and his personal property value is $100. By 1870, Charlotte has passed away and William has remarried Elizabeth. The family – minus 2 sons enumerated in 1860 as they have died – and with the addition of three more children are residing in Franklin township in Coshocton county. William, 42, lists his birthplace as New York, occupation Shoemaker, and no real estate amount is listed. However, $350 is listed as value of personal property. The column listing whether parents are of foreign birth is not checked (there are no checks in those columns on that page at all so it is unknown whether the enumerator asked that question). The difference noted between this census and the 1850 and 1860 censuses is the enumerator wrote out on each line the place of birth instead of relying on ditto marks. William is 52 on the 1880 U. S. Census, still married to Elizabeth, and still living in Franklin township. The two oldest sons, William Henry and George Washington, have left home; one son, Florus, has died; and two more daughters have been added to the family. William still lists his occupation as shoemaker and his birthplace as NY. This is the first census that asks a location for the parents’ birthplace. It shows William’s father as born in England and his mother as NY. The enumerator has written down the birthplaces instead of using ditto marks. Unfortunately, there is no way to determine what William listed on the 1890 U.S. Census since it was destroyed, and he passed away in 1896. Documentation for his death comes from: an obituary printed in the Democratic Standard, Vol. XVII, No. 48, on the front page; and one in an unknown Coshocton newspaper. His gravestone also lists his death date and his age. In later years, his children all listed his birthplace as New York. In the book “A Centennial History of Coshocton County. Ohio” by William J. Bahmer: George Washington Amore’s biography states “…his parents being William and Charlotte (Reed) Amore, the former a native of Troy, New York” (S.J. Clark Publishing Co., 1909, p. 160-161). William Amore was married three times – his first wife, Frances Price, whom he married in September 1848, passed away in April 1850 – less than two years after being married. His second marriage to Charlotte Reed in May 1851 lasted until her death in October 1862 – almost eleven years. He married for the last time to Elizabeth Spencer in January 1863 – a mere three months after Charlotte died. They were married when he died. On the marriage documents (Digital images, FamilySearch.org, "Ohio, County Marriages, 1789-1994,") there is not a listing for place of birth so those records do not add any information. 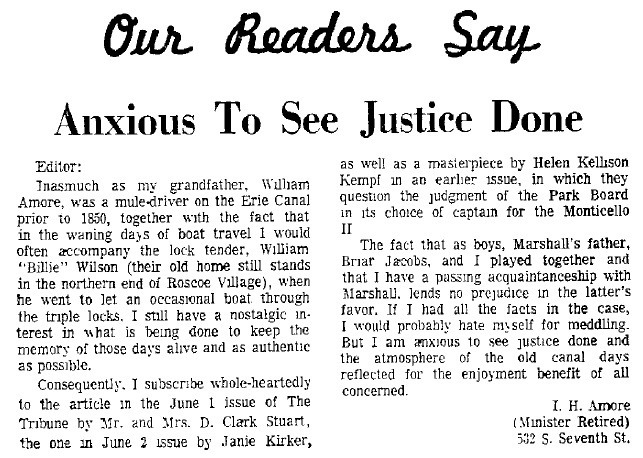 William’s grandson – my grandfather’s brother, Isaiah H Amore, wrote a letter to the editor of the the “Coshocton Tribune” that was published in it’s June 8, 1971 edition on the Opinion Page (accessed and downloaded digital image from NewspaperArchives.com). He begins by saying “Inasmuch as my grandfather, William Amore, was a mule-driver on the Erie Canal prior to 1850” which provides second-hand information about William’s occupation before 1850. Coshocton county is next to the Ohio and Erie Canal. Two rivers – the Walhonding and Tuscarawas merge there to form the Muskingum River (Wikipedia.com; Coshocton, Ohio). Reported on Ohio History Central (ohiohistorycentral.org), the Canal system brought more people into Coshocton in the 1820s and 1830s. The canal that eventually went from Lake Erie to the Ohio River was complete by 1833. Since there hasn’t been any documentation to prove or disprove William’s birth in New York, it is documented via his marriage to Frances Price, that William was living in Coshocton county in September 1848. If he was born in Troy, New York, his family could have made their way via the Hudson River north to Lake Erie, then along Lake Erie to Cuyahoga county in Northern Ohio, down the Ohio and Erie Canal to Coshocton county. In the same publication as George Washington Amore’s biography, is a biography on Arnold Babcock. His parents were Abel Babcock and Jane Amore – both of New York. Unfortunately, not much is known about Jane. She died in 1845 (memorial #91891488 findagrave.com) and is buried in the Caton Cemetery in Coshocton. The memorial states that she was 30 years, 3 months and 7 days old making her born on January 15, 1815 – 13 years before William. If Jane was a younger sister of William’s father and she was born in New York, then William’s father could have been brought to the United States from England as a younger child with Jane being born after arriving in New York. Locating the Babcock family in New York in censuses prior to them arriving in Coshocton, might provide a clue – especially if they lived in the same vicinity as an Amore family. However, Jane may be a much older sister of William’s – possibly born of a different mother. Tidbit of information: William and Elizabeth’s oldest daughter was named Jane (and called Jennie much of her life). There is an Enoch Amore found in the 1820 U.S. Census living in Wawarsing in Ulster county, New York. The household is enumerated as having 3 males under the age of 10, 1 male 45 and over, 1 female under 10, 1 female 26-45 and 1 female over 45 and one person involved in commerce. It can be deduced that Enoch Amore is the male age 45. There are three sons under the age of 10, one daughter under the age of 10. Enoch’s wife could be the female between 26 and 45 with his mother or mother-in-law over age 45 or his wife could be over 45 and a sister of one of them the female 26-45 (or an older daughter of Enoch’s from a previous marriage). Since William wasn’t born until 1828, he would not have been enumerated in this census. Needless to say, I have not been able to locate Enoch in the 1830 U.S. Census – the first census William would have been enumerated. In the 1830 Census there is a William Amer indexed who is living in Albany, New York with one male under 5, 1 male 30-40 (presumably him), 1 female under 5, 1 female 5-10, and one female 20-30. There is a Patty Amour listed in the 1840 U.S. Census living in Adams township of Coshocton county and living right next door to the Abel Babcock family. Enumerated in the Amour household are 1 male 10-15, 1 female 10-20, and one female 40-50. Presumably, Patty is the female aged 40-50. In 1840, William was 12 which would fit the male age 10-15. Living next door to the Babcock family could also provide a clue since Jane Amore was married by then to Abel. The “Ohio, County Marriages, 1789-1994," index and images, FamilySearch indexes an image as Anny Ann Amore marrying Joseph Lime on May 2, 1843 in Fayette county, Ohio. Looking at the image, the first name looks more like Amy. Another interesting piece of information comes from the fact that just across the county, another Amore family lived. Francis Amore and Charlotte Thiebaut – both born in France – and living in Coshocton by 1840. They also had a daughter named Jane. They were of the Catholic faith and descendants of William Amore were not Catholic. As long as memory serves, it has always been said that the two Amore families were not related. Saying they weren’t related doesn’t necessarily make it so though; however, like so much else, nothing has been proved or disproved. What has been learned? Documentation consisting of the 1850, 1860, 1870, and 1880 U.S. Census records; three marriage records; two obituaries, and a burial indicate that at least from October 1848, William Amore resided in Coshocton county, Ohio. His occupation in each of those (above) census records was shoemaker. What is not known? The names and nationality of his parents, the exact location of his birth – it could be Ohio or New York; or if he was related to Enoch Amore, William Amer (could be a misspelling) or Patty Amour (another spelling issue).